Bob Dylan’s new album “Tempest” is currently ranked number 1 on Amazon’s best selling music list. 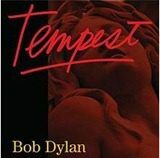 “Tempest” is Bob Dylan’s 35th studio album. The singer, who is now (hold on to your hats) 71 years old, has denied allegations that this will be his last. The new album is set for a September 11 release date. Amazon has it available for pre-ordering priced at $10.99 on CD, and it comes with a $1 Amazon MP3 credit. The album is also available on vinyl for that truly authentic sound. At Amazon, the record is $25.99. The CD can also be found at Walmart.com for $11.88. On iTunes it’s $9.99. At Bestbuy.com the CD is $12.99 and on vinyl it’s $33.98. There may be something more in the brew at BestBuy – they have a listing for a “Tempest (Best Buy Exclusive)” priced at $26.99. But there’s no image and no further details indicating what this is about. We have contacted BestBuy and will provide an update when we learn more. The album includes ten tracks: “Duquesne Whistle,” “Soon After Midnight,” “Narrow Way,” “Long And Wasted Years,” “Pay In Blood,” “Scarlet Town,” “Early Roman Kings,” “Tin Angel,” “Tempest,” and” Roll On John.” The album’s namesake, “Tempest,” is a 14 minute, chorus free song about the RMS Titanic.